Two women of the menstruating age, who trekked the Sabarimala hill Wednesday, were stopped midway by protesters opposing the entry of women into the Lord Ayyappa temple, police said. Reshma Nishanth and Shanila, both residents of Kannur district, attempted to climb the holy hill early in the morning but were prevented from proceeding to the temple after the devotees spotted them with 'Irumudikettu' (offerings to Lord Ayyappa). "They were stopped at Neelimala (en route Sabarimala). They were brought down after protests broke out. After taking them down to Pamba, they were moved to Erumeli at around 7 AM," police told PTI. Sources said the women came along with a group of men. "We had informed the police before reaching here seeking protection," Nishanth told media. TV channels reported that both women, who are now under police custody, sat on indefinite fast demanding that they be allowed to enter the shrine. 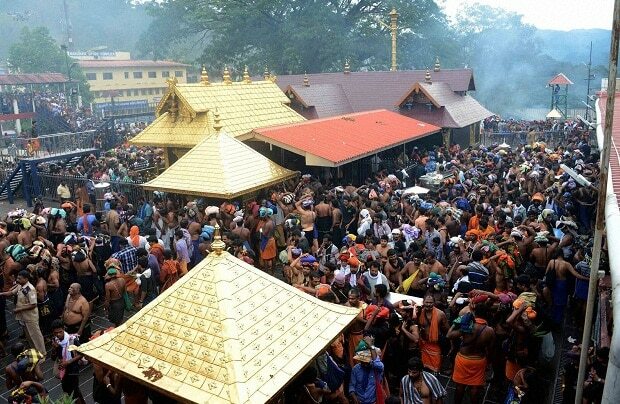 Reacting to the development, Devaswom Minister Kadakampally Surendran termed the act of stopping devotees (women) from visiting Sabarimala "barbaric." Since the shrine opened for the Mandalam-Makaravilakku festivities on November 17, it had witnessed massive protests by devotees and right-wing outfits against the state government's decision to implement the Supreme Court's order, allowing women of all ages to enter the temple. Traditionally, girls and women in the menstruating age group of 10-50 years were barred from offering prayers at the shrine, the presiding deity of which is "Naishtika Brahamachari" (perennial celebate). According to police, three women of menstruating age have so far offered prayers at the hill temple during the season. The hill shrine would be closed on January 20. Violence involving BJP-RSS and the ruling CPI(M) had rocked parts of Kerala during the January 3 hartal with several houses and shops of rival leaders and workers being attacked over the entry of two women into the temple. Kanakadurga (44), a civil supplies department employee from Angadipuram in Malappuram, and Bindhu (42), a college lecturer and CPI(ML) activist from Kozhikode district's Koyilandy, had entered the hill shrine on January 2, breaking a centuries-old tradition and defying dire threats from right-wing groups. Following their entry, the head priest decided to close the sanctum sanctorum of the temple in order to perform the "purification" ritual, which used to be carried out during the time of the violation of temple customs.